When it comes to packaging foods for VERY long periods of time we’ve had some, but admittedly not THAT much experience. We’ve only been working on our food storage for 4 years. Since it’s only been 4 years, a lot of foods we store wouldn’t or couldn’t have gone bad by now anyways. We also believe in such regular rotation, that our long term food storage food items don’t sit long enough to spoil. We also live in very dry weather, so humidity and moisture haven’t been something we’ve had to deal with. So yes, we’ve had it easy. That’s why when it comes to words like Oxygen Absorbers, we get a little shy, because we don’t feel that we’re that expert on the subject. Still however, we get asked questions about it, and started to do a little research when we came upon this article at LDS.ORG. We are highlighing part of the article here for you, but urge you to check out the full article for TONS of tips on storing your food long term. The part we are highlighting is the Oxygen Absorbers section. What are oxygen absorbers made of? Oxygen absorbers are small packets that contain an iron powder. The packets are made of a material that allows oxygen and moisture to enter but does not allow the iron powder to leak out. How do oxygen absorbers work? Moisture in the packaged food causes the iron in the oxygen absorber to rust. As it oxidizes, the iron absorbs oxygen. Oxygen absorbers rated for 300 cubic centimeters (cc) of oxygen work well for properly packaged dry food in containers of up to one-gallon capacity (4 liters). Is the use of oxygen absorbers equivalent to vacuum packaging? Oxygen absorbers remove oxygen more effectively than vacuum packaging. Air is about 20 percent oxygen and 80 percent nitrogen. Absorbers remove only the oxygen. The air left in the container is mostly nitrogen and will not affect the food or allow the growth of insects. What types of products can be stored using oxygen absorbers? Products should be low in moisture and oil content. If the moisture content is not low enough (about 10 percent or less), storing products in reduced oxygen packaging may result in botulism poisoning. What types of containers can be used with oxygen absorbers for food storage? Metal cans with seamed lids. Foil pouches (such as those provided by Church home storage centers and available from store.lds.org). PETE plastic bottles with airtight, screw-on lids. Glass canning jars with metal lids that have gaskets. Oxygen absorbers are not an effective treatment method for plastic buckets, milk bottles, or other types of plastic bottles not identified as PETE or PET under the recycle symbol. 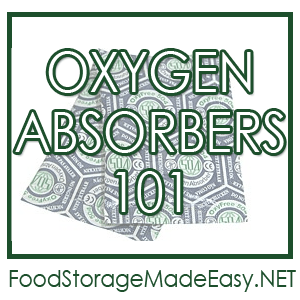 What is the proper way to use oxygen absorbers? Cut open the top of the bag of absorbers. Do not open the individual absorber packets. Remove the number of absorbers from the bag that you will use in the next 20 to 30 minutes, and spread them out on a tray. Remove additional groups of absorbers from the supply as you need them during the packaging process, but do not open and close the bag repeatedly to get only a few absorbers at a time. Reseal the remaining supply of absorbers by one of the following methods. Do not store absorbers in ziplock bags. Seal the bag of absorbers with the special blue clamp provided by the home storage center. Seal the bag of absorbers with an impulse heat sealer. For longer storage when an impulse sealer is not available, remove the absorbers from the bag and place them into a glass canning jar that has a metal lid with a gasket. A one-pint jar (500 ml) will hold 25 absorbers. Place one absorber into each container of food as it is packaged. So there you have a highlighted part of the article. Check it out for more tips on packaging food for longer term storage! Feel free to add your tips and comments about packaging your foods for long term storage!